Popular comedian, Bright Okpocha, aka Basketmouth, has been able to make a success of his comedy career so whenever he dishes out advice on how to succeed in the entertainment industry, the discerning would surely listen. “Sometimes, young people come up to me and ask me to show them way but I find that funny because all they need is right in front of them. In our days, we didn’t have Instagram and other social media. If we wanted to be seen, we had to go out and perform at various far-flung places, but today, you can reach the world from the comfort of your bedroom, provided you have access to the Internet. I have realised that it is the billionaires that hustle the most. While the people that don’t have much are living like billionaires. As for me, I don’t want to be a business man, I want to be the business,” he said. 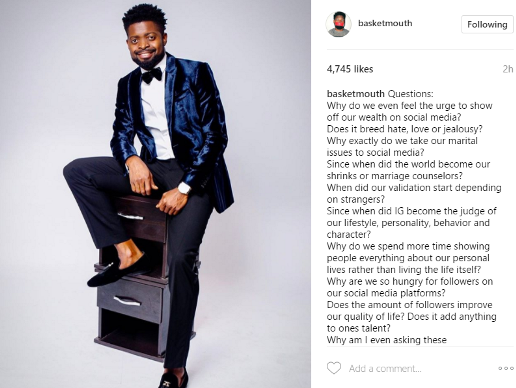 Apparently appalled at what transpired between On Air-Personality Freeze and estranged wife Opeyemi last weekend, Comedian Bright Okpocha aka Basket mouth took to Instagram to ask various questions bordering on engaging social media to wash dirty linen publicly especially among celebrities. Could he be referring to Freeze, who he is not on speaking terms with? OAP Freeze whose name Ifedayo Olarinde had on April 22, taken to social media to lampoon his estranged wife, who had also granted an interview to an online platform and revealed how he battered her just because he wanted to bring in another woman. Also citing Freeze’s loquacious nature as hereditary, the mother of two disclosed how her kids were in support of the interview granted because Freeze had crossed his boundaries. In response to the interview, the OAP, who has become famous by his criticism of pastors and churches, also released a video and text of how he was placed on suicide watch while he was still married to Ope. Among other things said was the fact that his estranged wife should tell the world how her father died and what killed him.